I like to organise things to do in advance when I'm visiting a foreign city and Buenos Aires was no different. I'd booked us on a couple of activities before leaving including a Fuudis tour – a restaurant crawl through a BA suburb, and a FotoRuta tour – a photography tour where you're supplied with a set of clues you use as prompts to photograph a particular neighbourhood. Both were fantastic and I'd highly recommend them. Another advantage of all this prior googling, was discovering that Buenos Aires had a yarn district! Not surprising given Argentina is one of the world's major wool producers and knitting is apparently still taught in primary school. 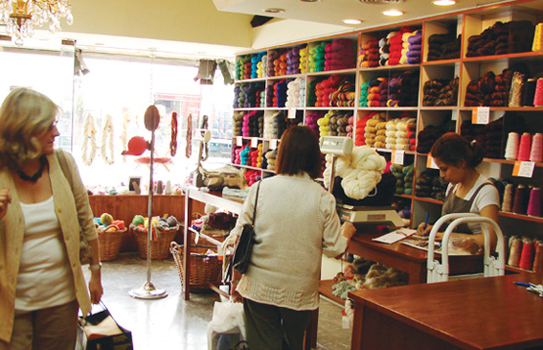 The yarn district is located in Villa Crespo on Av. Raúl Scalabrini Ortiz. The closest subway is Malabia. If you walk towards Palermo from the junction of Ortiz and Av. Corrientes the yarn shops are roughly between Av. Loyola and Av. Córdoba on both sides of the road. Most of the shops are floor to ceiling shelves stacked with yarn and it can be a bit overwhelming when you don't quite know what you're looking at or how to speak the language. There are a lot of acrylics, so you need to watch out if you're looking for natural fibre. Of course they do also sell wool from sheep, llama and alpaca. Most of the shopkeepers I came across didn't speak English, so look out for the word 'lana' if you want wool. The Christmas period isn't the best time to go as a couple of shops were closed for the break. The two I was sorry to miss out on were Milana and Moussa, but that didn't stop me from visiting the ten or so that were still open! Yanabey was my favourite and where I spent the most money, but Arte Natural was pretty fascinating – yarn everywhere, including all over the floor. Left – wall of yarn at Nube. Above right – window display in yarn district. Below right – the wild Arte Natural. Most of the yarn is sold in approx 200g skeins. The price is given per kilo and Yanabey had a little guide at the bottom of each shelf indicating how many grams you'd need for a typical jumper (sweater). All the skeins I was looking at were much, much cheaper than in Australia, the UK or US – approximately $7 AUD for a 200g skein ie $1.75 for a 50g ball – and that was for wool. I've only just done this conversion properly now... I should have bought WAY more! There were also some really interesting yarns, including a lot of recycled T-shirt yarn and some vegetable silk. If you're planning a trip and you're into yarn, I'd definitely take an extra suitcase! My purchases! Acrylics at left and wool and cotton at right. omg I want to go!!!!!!!!!!!!! Even without the yarn it's a wonderful city Maree – definitely worth a visit.